Hi my name is Lise and i have a 5 month old german shepherd and the problem is that when men or loud voice talks to him he urinates and also when one of my boys only looks at him he does the same. 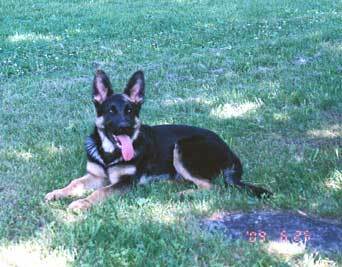 Submissive urination is common in male and female puppies. Sometimes it can be heightened if puppy is scolded a lot. If that is not the case and puppy likes play toys, before he has a chance to widdle submissively, throw a toy. If he is not toy orientated, turn away, sing and dance around. Try not to baby him and when at a distance from him, get people to make loud noises, especially just before he is fed. 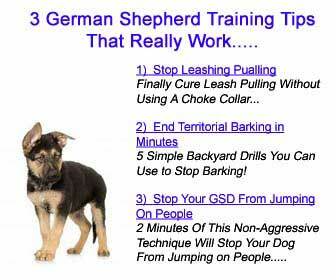 Loud voices in playilng or singing as you walk around the garden ignoring the pup usually helps a lot. It would be interesting to know if the puppy was adequately socialized and heard lots of noise from three to eight weeks of age. Talk to the pup in a normal bright and happy voice not s if he is a tiny human baby. If he tends to run to you and then widdle, you can also turn away and run off giggling or singing if the toy idea does not work. Do not make a sound or act disgusted at him widdling. That tends to make matters worse as puppy tries to appease you, not understanding what he has done wrong. If certain folk trigger widdle pup, get them to also try throwing treats at a distance of two yards (metres) from the pup to divert his attention and break the cycle. Giving puppy somethilng to learn and set boundaries that are consistent also helps build confidence.